I wanted to drop in and chat more about some of the DIY’s that we completed in this space, and believe me there were plenty. First off, when adding the stacked washer and dryer, we opted for a built-in look. To achieve this, we simply used plywood cut partial width of the machines. We only wanted it to extend back halfway, and we then installed cabinets the remainder of the way. Before installing the cabinets, we added to cabinets on top. To achieve this, we added cut plywood to the top in a cubby style. We then needed to incorporate hidden storage, so we headed to ReStore to pickup a couple of pre-owned cabinets. I am a firm believer in attempting to use materials that can be recycled/repurposed when possible, This was the perfect opportunity, since our local ReStore had a ton of donated kitchen cabinets to purchase as less than a 1/4 of what you would pay for brand new ones. You should have to find a measurement that would work for your space. 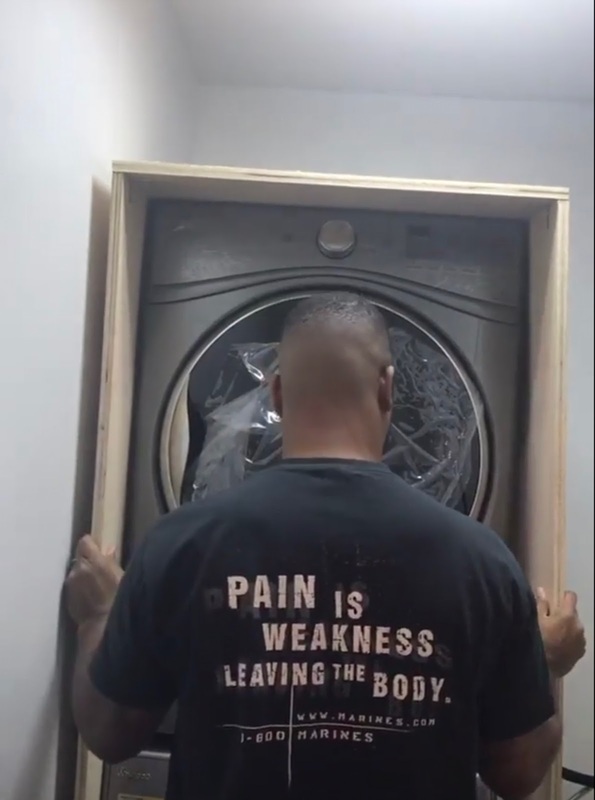 We were fortunate to find one that was perfect for the right side of the washer and dryer. For the top, since we were built out the cubby, so we opted to purchase a cabinet and use the doors only since we found a size that we needed. We also framed out the plywood, using wood shims. The shims give the raw edges of the plywood a more finished, bulkier look. After attaching the cabinets and cabinet doors, I tiled the space using mesh mounted MSI Bianco Subway tile. Once I got the tile done, I was ready to paint. I painted the cabinets using the same as the wall color, which is PPG Raindrop White. After painting, we added crown molding to the top, and painted it the same color. After adding the crown, I worked on my wood shelving for the space. 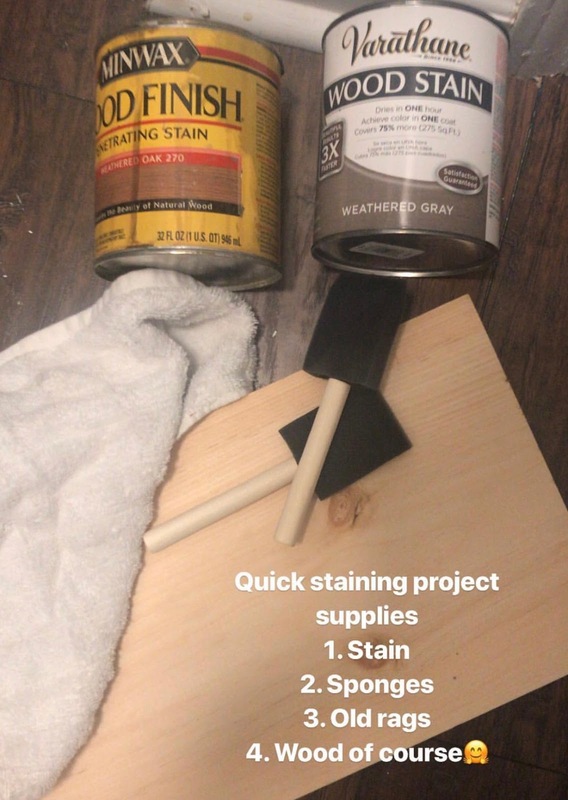 This was a simple and easy stain project, using this tutorial. 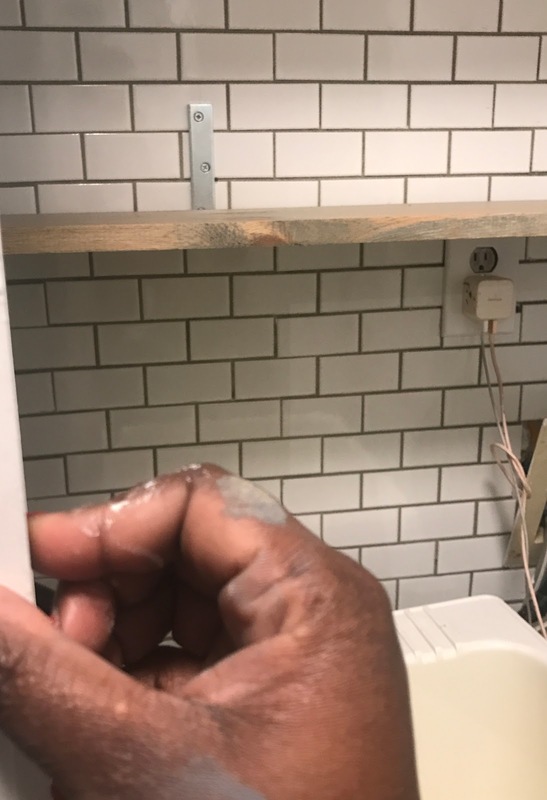 The shelves were attached using metal “L” brackets drilled through the tile. You have to have a special drill bit to drill through tile. After installing the shelves, I added the cabinet hardware. I used handles that I had removed from my kitchen when I made it over last summer. They were originally brushed nickel, and I spray painted them gold. I also mentioned before that I opted to spray paint the utility sink legs gold as well and change out the light fixture. We also painted the linen closet door the same color as the other interior doors around my home, Thunder Gray. And that’s it. 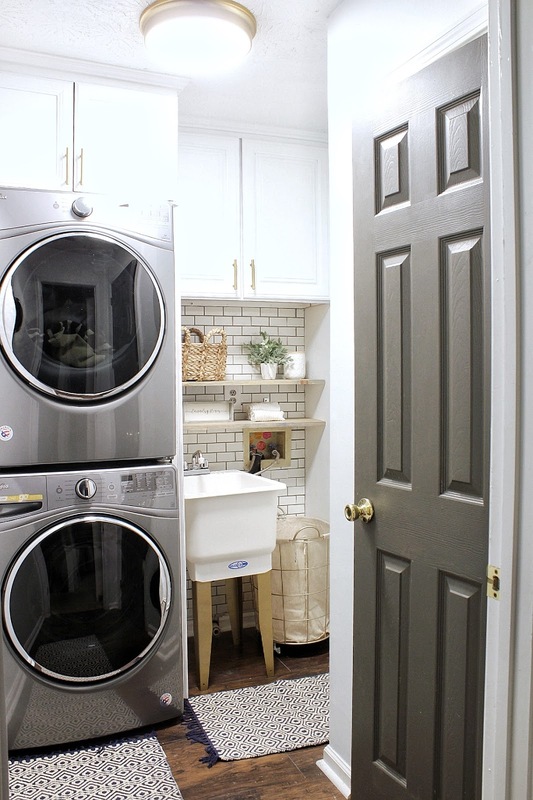 We absolutely love how this space functions now, and even though laundry is still one of my most hated chores, this space makes it a lot easier. Next up, is the ugliness that exists behind the dark gray door aka my linen closet. Would you be willing to tackle all of these DIY’s to create a space that you love? Do you need any clarifications or have any questions? Let me know in the comments. Thanks so much for stopping by. It's amazing how the light and white cabinets brightened up the space. I wish I was bold enough to tackle tile and grout. (Not that I have anything I want to just would like the skill lol) How do you like having the sink in the space? Hi Adriane. I love having a sink in the space. Especially, for quick washes and with all of the projects that I do, I lknow it will come in handy. I love seeing this! I have a small, awkward laundry room, and we just decided a month ago to try stacking our washer & dryer to create more storage. Do you have any complaints about the stacked washer/dryer so far?